Our first impression of seeing the Bremshey Orbit Control was it it looked like a tank in comparison to other rear drive elliptical trainers! It looks like a serious piece of kit and the sticker on the front footplate with “German Design & Engineering” reinforces the heavy duty nature of this cross trainer. The Orbit Control series of machines from Bremshey has been around for a number of years and this particular model (the 16″ rear drive version) has been sold by various UK retailers at over £500. Whilst, previously we’d given it a quick try, we didn’t do a full review as it just seemed too expensive for the spec. However, the machine is now available at a far more competitive price and we’re setting off to find out if it’s any good! As already mentioned, the Orbit Control 16 is a serious looking machine and quite bulky in design. Fortunately, this translates to a rather smooth and sturdy stride action when using the machine. The 7kg flywheel weight advertised is rather deceptive as this machine has total rotating mass of some 28kg and this is very noticeable when being used – it is smooth! Historically, some cross trainer manufacturers had overstated the stride lengths of the their machines – we’ve come across quite a few “16” stride” machines over the years that actually had a stride length of under 15″. Fortunately, in the last couple of years, this confusing practice seems to have seized, but as this is an older model, we had feared the worst. However, within a minute of seeing and using of this machine, it was obvious that that no creative measurements had been used! If anything, from the feel of the machine, your reviewer thought that the stride length was longer then 16″ and actually only believed the figure as being accurate after physically measuring it. So, what about the console? It’s got a decent sized two colour back-lit LCD display, a rotating dial as well as 3 buttons. 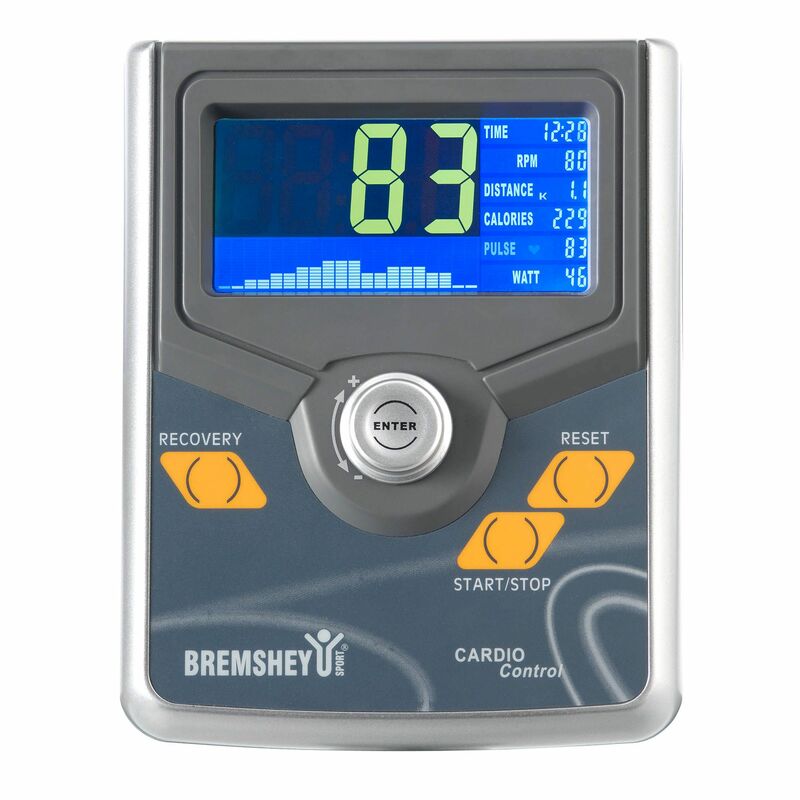 In terms of functionality, it has pretty much everything you could possibly want with a good selection of preset programmes, heart rate control, user-defined programme as well as a constant watt programme, which means the Bremshey Orbit is an ergometer and could be used for rehab purposes! We’re pleased to see that the console has a wireless heart rate receiver built in, which is Polar compatible. In effect, it means that the machine can be used with any uncoded Polar chest best (not included) for some proper heart rate control exercise. In addition, the console has 4 user profiles and for each you’re able to enter your characteristics such as gender, weight etc. in order to receive more accurate calorie count information. The warranty for the machine is pretty standard 2 year parts & labour. Given the build quality of the machine, however, we can only assume that unless it’s got issues on first use, it’s likely to be a providing year of trouble free use! 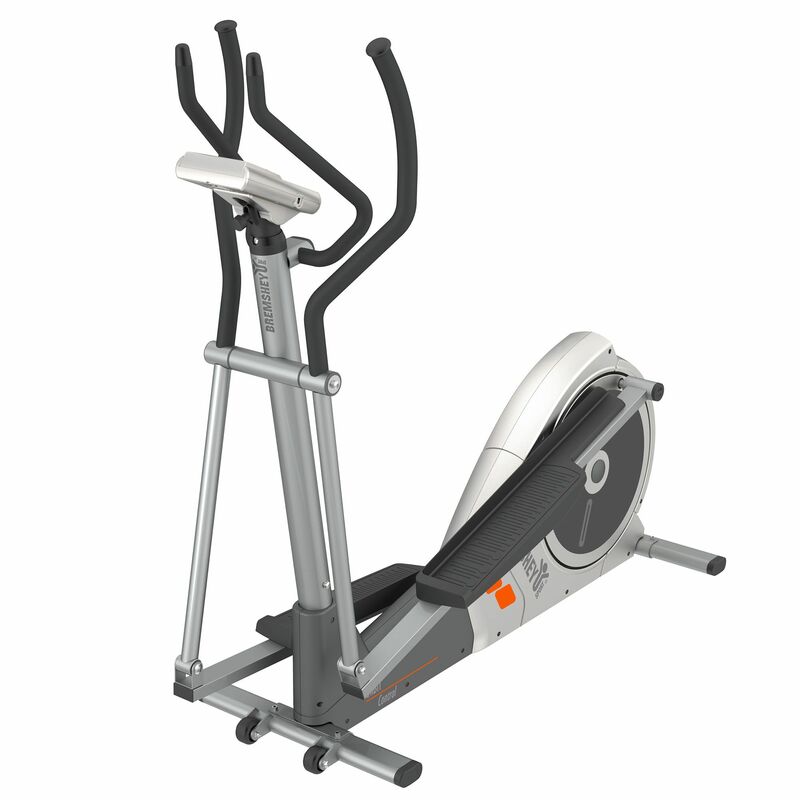 The Bremshey Fitness Orbit Control 16 Inch is not currently available from any retailers we're aware of in the UK. Not the prettiest machine we've seen!